Earlier in the month I signed up to run the Nike Women's Marathon with Team in Training. One of my lifelong goals is to run a marathon, but when I had to stop training due to injuries several years ago I thought I was never going to realize my dream. However, my aches and pains actually feel a lot better living in the drier climate and lower humidity. I've decided that it is now or never if I'm going to give running a marathon another shot. Plus I've just really missed running! I used to be a pretty health conscious person who exercised regularly, ate reasonably well, drank a ton of water, and went to the doctor every year for a routine check up. The past few years have been busy and stressful, and I've allowed a lot of my bad habits to creep back in and take over my life. These days the majority of of my meals come out a box or a can and I consume more than my fair share of sugar. I never get enough sleep and live on caffeine as a result. And, I can't remember the last time I saw the inside of a doctor's office. While I have managed to lose a little weight over the past year, I still have a long way to go to return to a healthy lifestyle! I can't continue to live like this and ask my body to train to run a marathon on October 20th, so I'm facing the reality that I need to make some major life changes. It's time to give up the caffeine and sugar, and start cooking healthy meals again! I need to start getting the proper amount of sleep. And, I definitely need to start being more conscious of how I spend my so called free time. It is so easy to waste hours surfing the web, when that time could be spent doing more worthwhile things. One of the hardest thing about long distance training is how time consuming it is and how much of your life you have to sacrifice to fit it in. For this month's self-portrait, I thought it would be fun to do a photo representation of what I feel like my life has been like the past few years. However, I want to state for the record that this photo is staged! 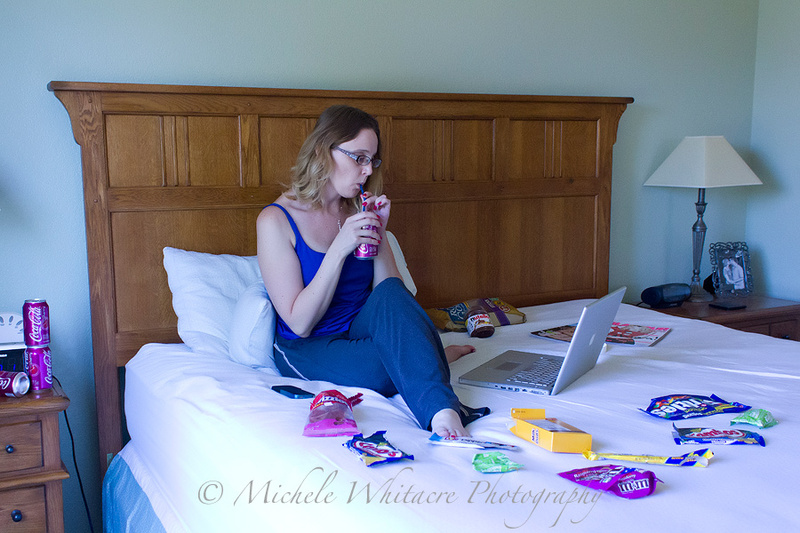 I don't usually sit around eating quite this much junk all at the same time or piling the wrappers up around me on the bed. I'm bad, but I'm not quite that bad. As I was taking this photo I decided that I am going to have to start considering purchasing a new wide angle lens. I really like being able to include a lot of my environment in my self-portraits but the only wide angle lens I own is the kit lens that came with my Canon Rebel and doesn't fit my new camera body. So, I'm still using my old camera for my self-portraits. That isn't too big of a deal, except I'm already starting to forget exactly where the buttons and menu settings are as I get more and more used to my new camera.